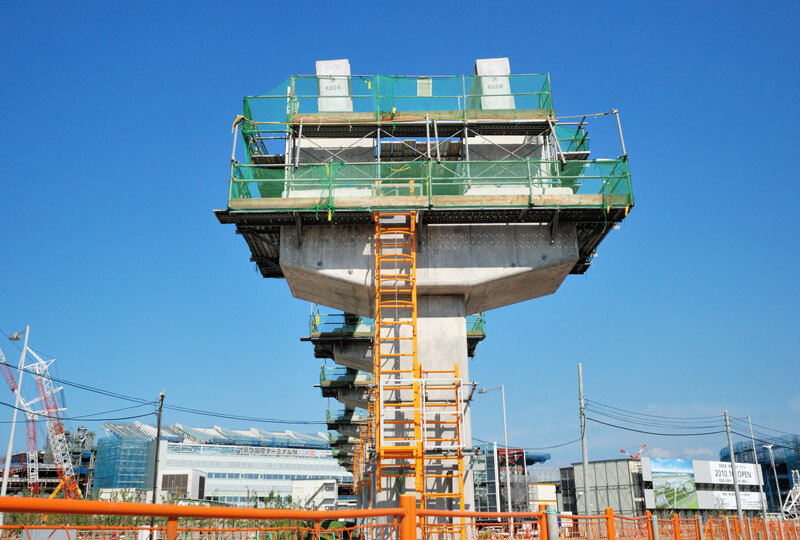 Construction Gallery - Tokyo Monorail, Japan. 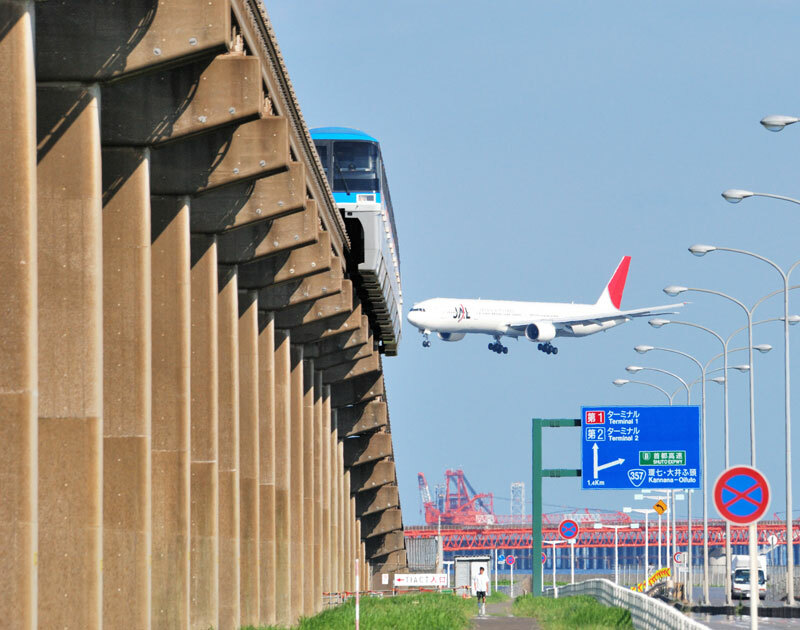 Tokyo-Haneda International Airport is getting a new fourth runway, which is located on landfill further out in Tokyo Bay. The new runway will allow the airport to operate on a 24 hours per day basis. With that, more international flights will be made in and out of the airport. A new terminal is being built to handle International flights. It's due to open in October of 2010. 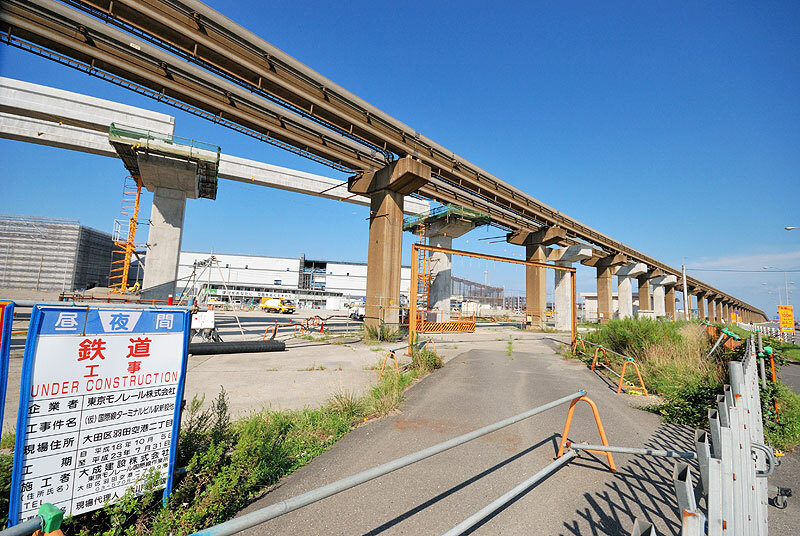 The Tokyo Monorail will get a new diversion with new track being constructed to the new Terminal #3. A new station will be added at the terminal. The new terminal (right) and parking lot (left) can be seen in the distance. Building new track without disrupting current operations is quite a challenge for engineers and construction companies. While the dark track looks quite old compared to the new beams and pylons, this stretch of track opened in the early 1990s when the new Terminals 1 & 2 were completed. This pylon supports new beams that soon will carry millions of passengers to and from the airport. This particular support is more massive than most, as it will support both concrete track (visible) and steel track (not installed yet). 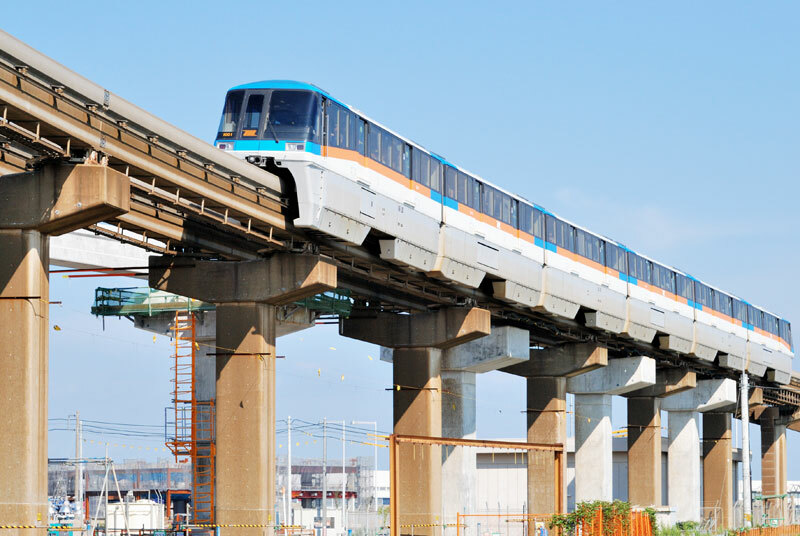 Steel monorail beams are installed on Japanese ALWEG monorails when longer spans without supports are required. Here we see a combination of supports of older and brand new. 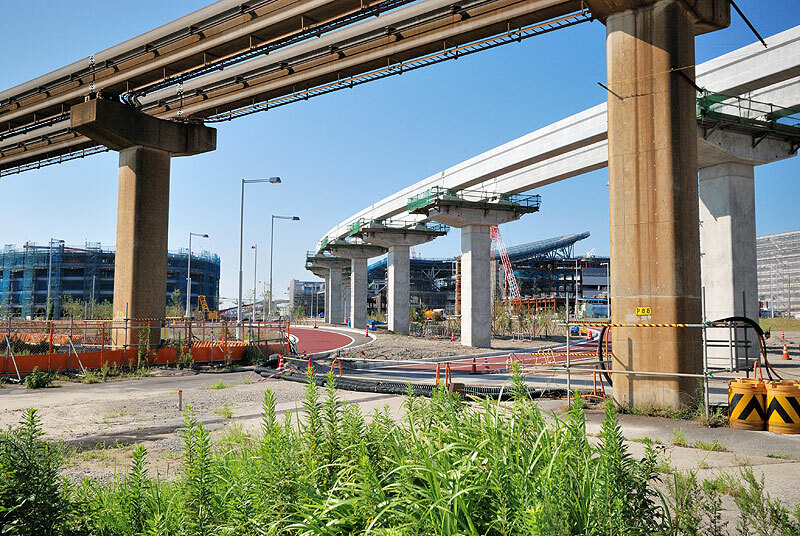 Doubling up on supports will allow for a relatively quick installation of the 'connector beams' when the new track is put into service. Pull the old beams out, install the new ones, hook up the bus bars, test, then open! We're guessing that everything will be ready for switching to the new track when the connection is made, allowing for a track switch in a matter of days. 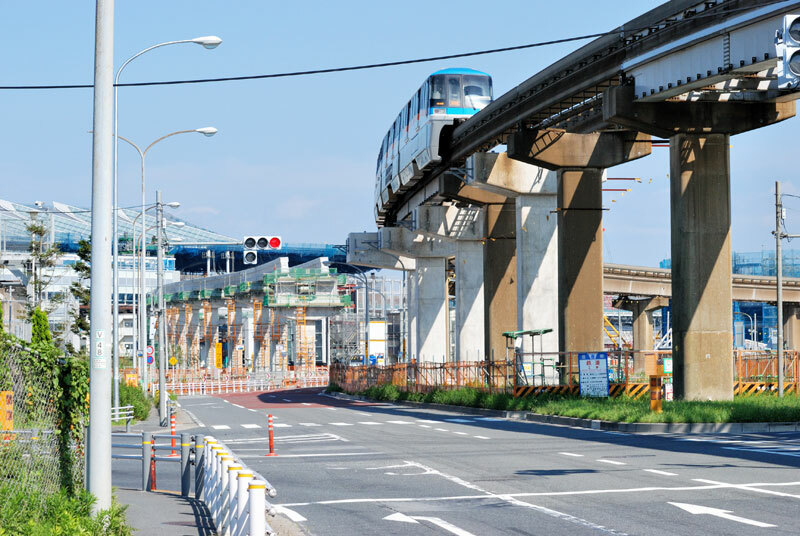 While this image has no construction in it, we're including it because it's one of the most unique photos of Tokyo Monorail we've ever seen. To see more of Yuzi Kanazawa's wonderful photographs, as well as these images in full resolution, be sure to visit his ykanazawa Flickr site.